Director King Vidor’s 1935 movie, The Wedding Night, is perhaps best known today (if it is known at all) for the fact that it was mogul Samuel Goldwyn’s final failed attempt to turn his discovery and protégée, Russian actress Anna Sten, into the next Greta Garbo. Having put her under contract in 1931, Goldwyn invested much time and money in his attempts to groom Sten into an exotic, glamorous star. However, none of the projects he put together for her seemed to work, she continued to struggle with English, and audiences just weren’t buying what Goldwyn was trying to sell them. 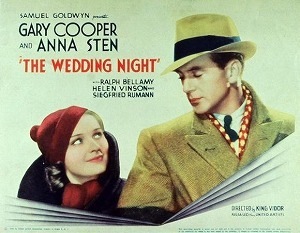 The Wedding Night was Goldwyn’s final stab at making his hopes for Anna’s stardom come true – the movie was mockingly referred to in Hollywood as “Goldwyn’s Last Sten.” While the film and Sten received decent reviews, the audience didn’t come and the movie, like the Goldwyn/Sten alliance, was a flop. That’s too bad on both counts, because Anna Sten turns in a beautiful performance in a movie that’s sensitive, heartbreaking, and surprisingly realistic about its characters’ fates for a Hollywood movie of the time period. The movie starts out with the trappings of a “city slickers in the country” comedy. Gary Cooper plays Tony Barrett, a Fitzgerald-esque writer whose life of partying and drinking with his shallow but not unlikeable society wife, Dora (Helen Vinson), has undermined his talent. His latest book is rejected by his publisher and he is flat broke. The only thing to do is pack up and head to his country home in Connecticut, where he can try to get some writing done. Tony’s marriage isn’t particularly troubled as the movie starts. He and Dora bicker, she’s not as supportive of his work as he would like, and the wild life they’ve been living in New York is obviously taking its toll on them, but there seems to be an underlying affection there as well. Tony sells part of his land for some much-needed cash and Dora somewhat reluctantly decides to take the money and return to New York without him. Tony doesn’t seem surprised or especially angry about this. Dora likes the city and he needs to stay in the country to work on his novel, so they part ways for a while. Little do either of them know how much this separation will affect their lives and their marriage. Tony has sold his land to a local family of well-to-do Polish immigrants, the Novaks. The patriarch of the Novak family is still steeped in Old World customs, treating his wife like a servant and dictating how his family will live. He has arranged a loveless but financially prudent marriage for his daughter, Manya (Sten), to a loutish young man, portrayed by Ralph Bellamy in what surely has to be one of the most thankless second banana roles in a career full of second banana roles. When Tony’s manservant decides he too has had enough of country living and abandons his job, Tony hires Manya to come to the house every day and do the cooking and cleaning. They get to know each other over the course of the winter. Tony gains inspiration for his novel and for his life from her sweetness and spark. Manya begins to realize that the flippant young man she wasn’t impressed with at first glance is at heart a sensitive artist and a gentle soul. They are snowed in at his house one night, and though they share no more than a kiss when Tony tucks Manya into the guest bed, it’s clear that they’ve fallen in love. It’s very romantic and lovely to watch unfolding, except for the pall cast over their burgeoning relationship by Tony’s marriage and by Manya’s betrothal. Tony knows Manya doesn’t love her fiancé and that he’s not at all good enough for her, but circumstances don’t allow him to do much to help her out of it. After the blizzard, Manya’s father is enraged and demands that she marry her fiancé right away, before the shame of her spending the night alone with a married man ruins her chances forever. Dora unexpectedly returns to the country and, after reading Tony’s new novel about a man falling in love with an immigrant girl, realizes that she is on the verge of losing her husband. The scene in which Dora talks to Manya about the novel, asking her how the book should end, is very well done by both Vinson and Sten. Dora is not unkind, but she makes it clear that Tony is not going to rescue Manya from her upcoming marriage. The marriage does indeed take place, leading to a tragic final act when Manya’s wedding night takes a terrible, violent turn. The beauty of this movie, for me, was in the realistic portrayal of the conflict between the Old World values immigrants brought with them to America and the temptations their children encountered here. Manya is different from her parents. She yearns for a life of more freedom, where she can marry for love. Before meeting and falling in love with Tony she was willing to stoically marry as her father wished, in spite of her distaste for her future husband. She believed it was her duty and didn’t know any other way of life. But after her time with Tony performing that duty becomes incredibly difficult for her. She has had a taste of freedom and romance, and after that it’s hard for her to go back to a life of being bullied by her father and pawed at by her brutish fiancé. Anna Sten frustrated her director and fellow actors with her struggles to speak English in this movie, but those behind-the-scenes problems don’t take away from her portrayal of Manya. If anything, they add to the character’s vulnerability as a young woman new to America and still learning its ways. Sten’s Manya is intelligent, feisty, loving, and ultimately self-sacrificing. It’s a very good performance. Gary Cooper is also wonderful and so natural onscreen. At a time soon after the end of silent movies, when many actors were still hamming it up in a very stagey way, Cooper is completely real and subtle, giving a nuanced and touching performance. His gorgeous, long-lashed eyes were so expressive that he could say a lot without uttering a word. In his autobiography, King Vidor talked about directing Cooper for the first time on the set of The Wedding Night. Initially he was worried by Cooper’s mumbling and the fact that he didn’t seem to be doing anything at all. “Imagine my amazement,” Vidor wrote, “when I watched our first day’s work on the screen and observed and heard a performance that overflowed with charm and personality.” Cooper’s work in this movie does overflow with charm and personality. He was so good, and there was much more to him than just the quiet cowboy he portrayed so often. I don’t feel like my summary of this movie does it justice at all. It can sound like a typical romantic melodrama in its particulars, but the way it is played out on screen is truly beautiful. When I started watching it I had no idea what the movie was about, or even whether it was a comedy or a drama. Going in with no expectations, I was very happily surprised by what a hidden gem The Wedding Night is.